When I found that there was a book of short stories called Noisy outlaws, unfriendly blobs, and some other things that aren't as scary, maybe, depending on how you feel about lost lands, stray cellphones, creatures from the sky, parents who disappear in Peru, a man named Lars Farf, and one other story we couldn't quite finish, so maybe you could help us out, I was pretty well sold. 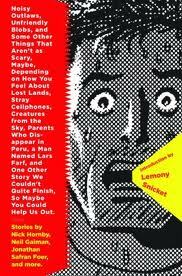 When I realized that stories by Lemony Snicket, Kelly Link, and Neil Gaiman, I was extra sold. It's a cute cute book. Wavering between weird and fantastical, it was a fun read. A few of the stories I had previously read in other collections. I particularly enjoyed "The ACES Phone" story about a little girl who finds a cell phone and hears rather strange things through it. There's a comic strip in it that I didn't get in the slightest. It's a book with ups and downs as you'd expect in just about any collection. You can't help but love that the book benefits 826 Valencia as well.